Lowland tropical forest is typical barbet habitat, especially in Asia and Central and South America. They are often associated with fruiting trees, and many species of ornamental tree that produce copious fruits attract barbets into gardens, towns, and even city parks, particularly in Asia and Africa, where cities such as Nairobi and Harare host barbets all year round. They live in a variety of artificial woodlands, too, from pine to coconut plantations. Dead wood is important for barbets to excavate nesting holes, which they also use for roosting all year round. Over-managed woodland is not really suitable for them. In East Africa several closely related species live in thorn thickets and bushy places on the fringe of the great wide-open plains, often associated with big termite mounds. In such places D'Arnaud's barbets (Trachyphonus darnaudii) are frequently seen foraging around thickets, ditches, and outbuildings alongside safari lodges, becoming quite bold and confiding. Professor Grzimek must have often seen and heard these lively birds in his camps in and around the Serengeti in Tanzania, unaware of the subsequent debate over their precise classification, as this is a species that has been "split" into two or three in more recent studies. Crested barbets (Trachyphonus vaillantii) are particularly common around termite mounds in open savanna woodland and thornbush, foraging about the tall earthy piles and perching openly upon them in pairs. Where the two occur together, D'Arnaud's prefers the flatter, open spaces between the little cliffs, streamside bluffs, and dry watercourses that the crested occupies. Tinkerbirds prefer tall forest with dense undergrowth, forest edge, and riverside woodland with tangled growth around the base of tall, old trees. Sometimes two similar species remain separate within a large geographical region through habitat choice. For example, the coppersmith barbet (Megalaima haemocephala) of India favors forest edge, plantations of figs, village and city trees, gardens, orchards, and mangroves—wherever there is fruit to eat and broken branches and stumps to nest in. It does not, however, live in cleared areas where rainforest has been felled, nor the wet rainforest of Sri Lanka, in which areas it is replaced by the crimson-throated barbet (M. rubricapitta). The scarlet-crowned barbet (Capito aurovirens) of Colombia and Ecuador is found close to water, in the varzea or swampy or floodplain forests, and in tall, secondary growth, but it is rarely seen close to the related black-spotted barbet (C. niger), which tends to replace it in the "terra firma" forest of drier, more solid ground. Many species, such as the red-headed barbet (Eubucco bourcierii) of Costa Rica, are found along trails and cut rides in forests, living at the forest edge, but are quickly lost once the original forest is felled. Some, such as the prong-billed barbet (Semnornis frantzii) of Costa Rica and Panama, prefer the high canopy of rich, damp, mountain forest where the trees are draped in long beards of moss and epiphytes. A number of closely similar species pairs occur in Africa, separated by range rather than habitat. These are examples of allopatric species, sometimes grouped as "superspecies": their ranges are complementary and do not overlap. The bristle-nosed barbet (Gymnobucco peli) lives in lowland forest in West Africa while the nearly identical Sladen's barbet (G. sladeni) replaces it in the forests of Zaire. Whyte's barbet (Stactolaema whytii) occupies woodland from southern Tanzania to eastern Zimbabwe, while the similar Anchieta's barbet (S. anchi-etae) is found in similar habitats to the west of this range. The range of the red-fronted tinkerbird (Pogoniuluspusittus) of eastern African bush is almost exactly surrounded by the more widespread yellow-fronted tinkerbird (P. chrysoconus). The red-fronted prefers wetter areas than the yellow-fronted in southern Africa, but drier areas in the northeast. Both overlap with the yellow-rumped tinkerbird (P. bilineatus), an example of sympatric species (found living side by side in the same area, the opposite of allopatric), although where the latter bird is most common the red-fronted is usually absent. Nevertheless, red-fronted and yellow-rumped may even sing from the same tree, but at different times. 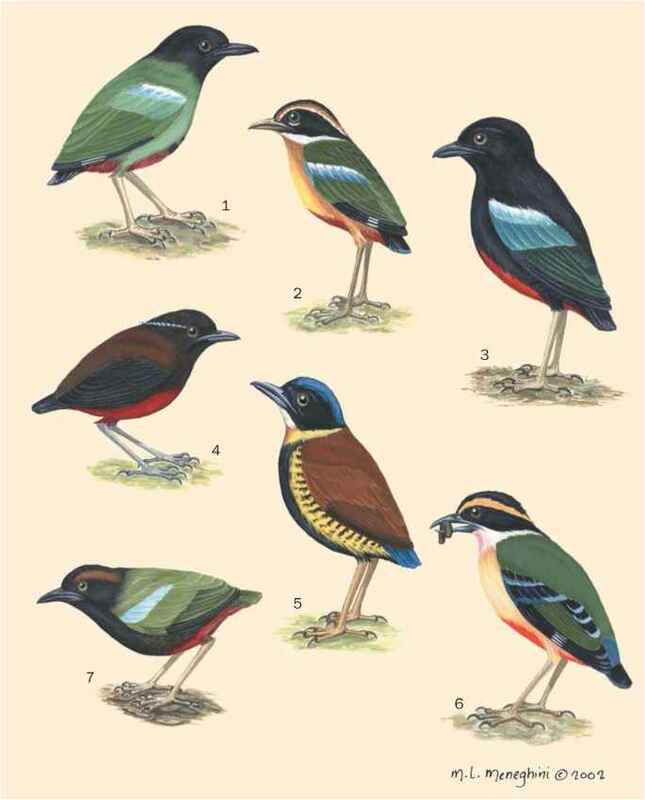 Where yellow-fronts and yellow-rumps occur together, the yellow-rumped prefers wetter, lusher woodlands; if the yellow-rumped is absent, such woods are, however, occupied by the yellow-fronted. Two more species with almost exactly complementary ranges are the bearded barbet (Lybius dubius) of West Africa, found in a band of woodland and forest south of the Sahara, and the black-breasted barbet (L. rolleti) just to the east of it, in Chad and Sudan. There is no known overlap but the two may perhaps meet in Chad. The southern edge of the combined range of these two is irregular and "fingered," precisely abutting the similarly fingered range of the double-toothed barbet (L. bidentatus) of more open woodland immediately to the south. These make a trio of species, two with similar habitat but different range, the third replacing them in a slightly different but immediately adjacent habitat.